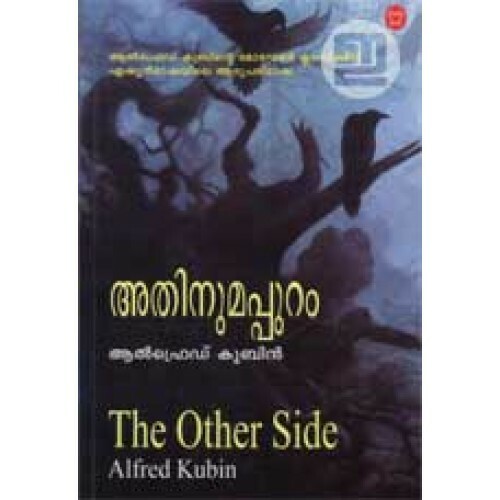 'The Other Side', a modern classic by Alfred Kubin, in Malayalam translated by Kalpatta Balakrishnan. 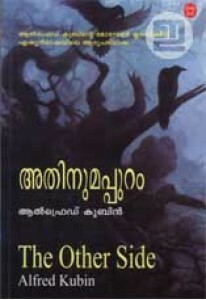 'Athinumappuram' tells of a dream kingdom which becomes a nightmare, of a journey to Pearl, a mysterious city created deep in Asia, which is also a journey to the depths of the subconscious. Or as Kubin himself called it, 'a sort of Baedeker for those lands which are half known to us'. Alfred Kubin (1877-1959) was one of the major graphic artists of the 20th century who was widely known for his illustrations of writers of the fantastic such as Balzac and Edgar Allan Poe. In his combination of the darkly decadent, the fantastic and the grotesque, in his evocations of dream and nightmare, his creation of an atmosphere of mystery and fear he resembles Mervyn Peake.